Back in July, it was announced that The Chronicles of Narnia: The Silver Chair Director Joe Johnston would be credited as co-director with Lasse Halstrom for his work on Disney’s The Nutcracker and the Four Realms. Disney dropped the final trailer for the film a few days ago, which features some new shots but no more story elements than the previous trailer. The movie hits theaters on November 2. Since Nutcracker also shares Producer Mark Gordon as well as Johnston with Narnia, it may be worth continuing to follow the production and see how they talk about a movie featuring a girl traveling to a magical world. Will The Silver Chair be their next project? For what it’s worth, Johnston’s Twitter profile still reads, “Currently directing: Chronicles of Narnia – The Silver Chair.” Here are our thoughts on the status of the production. Given that headlines are already drawing comparisons to Narnia, the success of this movie could definitely have an impact on whether or not The Silver Chair is made. I’ll be keeping tabs on it. Yeah, a lot of people seem to be comparing it to the live action Alice in Wonderland and Narnia. Personally, as a ballet enthusiast I’m more interested in those story elements rather than any perceived comparisons to other fantasy films, but I am interested to see if the press that comes out closer to the premiere will have any interesting tidbits about SC from either Johnston or Gordon. I believe this might be the hold up. Joe johnston and Mark Gordon wanna b at the Premiere of this movie. They might talk about the Silver Chair movie while they’re at the red carpet. So let’s see if they will when this movie comes out in theaters this November. The only problem I have with this theory is that it would be fairly simple to schedule a break in the pre-production process for Johnston and Gordon to attend red carpet events for another movie. That seems to be standard practice for actors at any rate if they have conflicting movie schedules. I think the opposite is more likely: SC was delayed, which enabled Johnston to step away for a while and work on another movie. Earlier on, there was some delay about the script, even though Doug Gresham seemed to be happy with it. Maybe they were just fine-tuning it. And I also gleaned that Joe Johnson was called back to finish this production. Or so I have noted here. I think I will just follow the rest of you and see what you think on this one. All I want to know is that there will be a film called The Silver Chair, and will I be able to watch it in my lifetime? The fate of 2018 production on The Silver Chair may rest on the success of "Nutcracker" and "Mary Poppins Returns". The former has Joe Johnston directing & Mark Gordon producing, the latter has David Magee screenwriting. I’m sure SC was delayed in 2017 because of "Blade Runner 2" and "Jumanji 2": One was filmmaker-driven, the other was a studio product. One tanked at the box office, the other made close to a billion dollars. It’s looking like we will be hearing something about SC soon as Joe is obviously gonna do some press for Nutcracker and hopefully gets asked about it. There could be many many reasons for the delay and it might not end up being as dramatic as some folks have suggested in terms of them being stuck, it isn’t good enough etc. If this is indeed Joe’s last film as a director, I can understand there being some pressure on him to go out with a bang! My thoughts exactly. Remember- winter’s coming on, and you know what that means- filming begins on the Silver Chair! I don’t know why this is considered the "final trailer" since it played before Ant-Man and the Wasp, before they released the "second trailer" online. 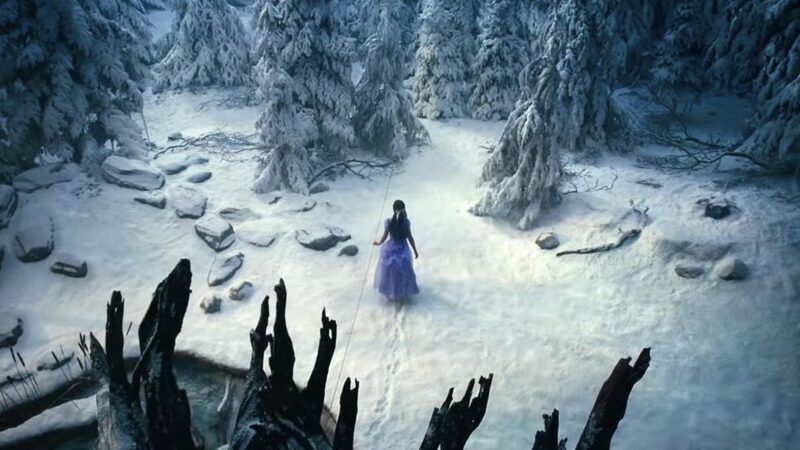 I don’t remember if the trailer was exactly the same, but it does look sort of like it has the same style as Narnia, but it also does not look as natural because of the gaudy outfits most of the characters are wearing. The girl reminds me a lot of Lucy Pevensie as played by Georgie, though. Based on the trailer (style and story points), it seems a bit closer to "Oz the Great and Powerful" than it relates to Narnia or Alice. Another one that comes to mind is "A Wrinkle in Time" but I’ve only seen trailers of that one so I’m less willing to make a comparison. I agree that the trailer looks more like Oz 2013. I didn’t really like that film, despite some lovely moments in it. Then again, I think this may be a good sign: If The Mark Gordon Company makes “The Silver Chair” in a closer spirit to “Wizard if Oz 1939” or even “Princess Bride” that might show they were serious in putting the spirit of the book before CGI battles & thrills (both Wizard & Bride were great adaptations of their books). I hope trailers for “Nutcracker” are just misleading, like “Bridge to Terabithia”. That film was much better than what it’s CGI-filled trailers.